I’m all about colors in my food. The more colors, the better. It just keeps things fun along with tasting great. A few weeks ago, I found beet hummus on a trip to Trader Joe’s and I loved the flavor. Not only that, the color was a gorgeous deep red color that turned hot pink when mixed with water to make a dressing. I used it to make a pretty bowl at dinner. It was kinda pricey and so I’d definitely consider it a splurge. 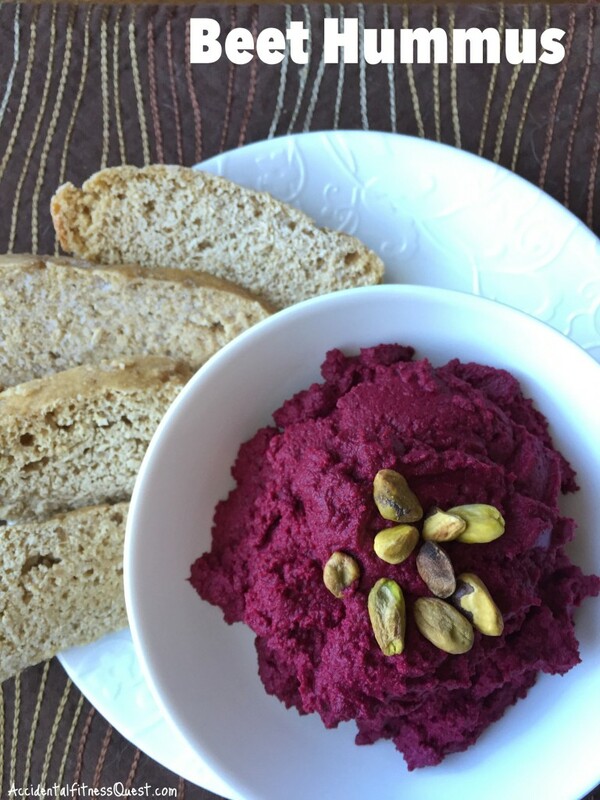 I was looking for a way to use the leftover beets from my Curried Apple Beet Soup, when it occurred to me that it can’t be that complicated to make my own beet hummus. I’d made traditional plain hummus before so I started with something similar and just added a little orange juice for sweetness. Peel and slice your beets and steam in the microwave for about 3-4 minutes until softened. Combine all of the ingredients in a blender or food processor. Pulse to combine slightly and then puree until smooth. If your mixture is too thick to blend, add a little water a tablespoon at a time until smooth. Makes about 2.5 cups of hummus at approximately 36 calories – 1g protein, 2g carbs, and 1g fat per tablespoon. I used about 1 really large beet. That sucker was huge and obviously weighed about 3/4 of a pound once I peeled it. I also used part of a tiny clementine instead of orange juice in this recipe since I was blending it. I know most of you may not have random clementines laying around so one tablespoon of OJ is perfect in place. This actually made quite a bit of hummus so you can use it in sandwiches, wraps, for dipping veggies, as a dressing. I plan to freeze part of it to see how it holds up for use later. You can easily halve the recipe if you don’t need two and a half cups of hummus. Get creative with it as well and mix part of it with a little curry powder for a spicy hummus. Stir in blue cheese and walnuts for another version. I topped some with pistachios and had it on crispy pita wedges with a dollop of sour cream. If you’re looking for another hummus variation, I’ve also made a chocolate hummus that’s a great sweet savory option.